It was a breathtaking weekend for Whitman Athletics: men’s and women’s swimming broke records to each win the Northwest Conference Championship, men’s basketball clinched its first NWC title since 1987 as it continued to 23-0 overall, women’s tennis opened their spring season with a sweep of Willamette and Pacific and baseball won 3 of 4 matchups against the Claremont Schools in their first time playing outdoors this year. The men’s swim team entered the conference meet fifth in the standings, but emerged with their second NWC title in three years by a margin of just 14 points. The women also claimed their first Conference title in team history, upsetting favorite and second place finisher Pacific Lutheran University by 622.5-576. Alongside the conference trophies, the Blues brought home a slew of individual honors. Senior Cole Weinstein won the men’s Co-Swimmer of the NWC, first year Mara Selznick received the NWC Freshman of the Year nod and head coach Jennifer Blomme was decorated with the NWC Coach of the Year award for her work with both the men and the women. The team also left many records shattered next to the bulkheads. Selznick claimed the school, conference and championship meet records in the 200 and 100-yard backstrokes. Fellow first year Sarah Davidson claimed Whitman records in the 500-yard freestyle, the 1000 free and the 1650 (the mile) free. Senior Tai Hallstein finished her last conference meet with school, conference and championship meet records in the 100 free and 50 free. Four women’s relays also each set new school, conference, and championship meet top marks. Whitman’s 400 free team, featuring Selznick, junior Tara Stahlecker, senior Josie Furbershaw, and Hallstein claimed first at 3:29.65. The 200 free relay saw Furbershaw, senior Nina Dipboye, sophomore Gaby Thomas, and Hallstein set the new bar at 1:35.93. Selznick, Dipboye, junior Katie Davidson, and Hallstein set new records as a group in the 400 and 200 medley relays. For the men, junior Clark Sun claimed the championship meet record in the 100 free. Weinstein set Whitman, conference and championship meet records with his effort in the 400 individual medley. 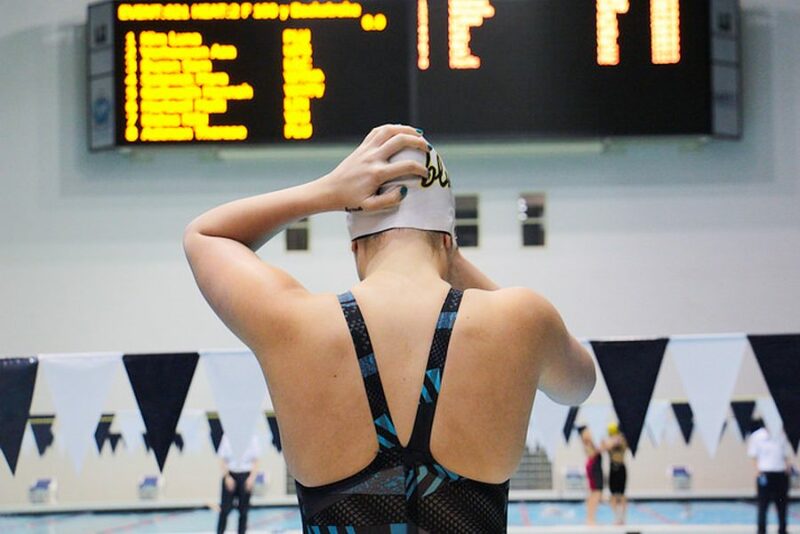 Many more swimmers achieved personal records and podium spots to set and maintain the lead for the Blues as they claimed these historic conference victories. 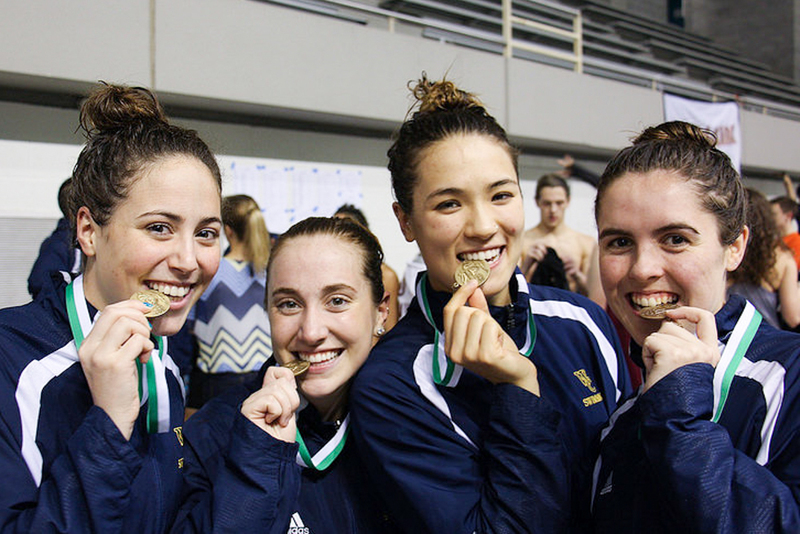 As the rest of the team unwinds and celebrates a memorable season, Selznick, Hallstein, Sun, Weinstein, senior Sean Terada and the women’s 400 free and 200 IM relay teams are waiting to hear if their times made the cut for nationals. They are already back in the water preparing for the opportunity to face the Division III’s best in Texas in March. While Whitman swimming was winning conference titles in Federal Way, men’s basketball was just a few miles away at Pacific Lutheran University claiming a trophy of their own. The team clinched the 2017 conference championship Sunday in an 87-58 rout of the Lutes. Whitman shared the title with Pacific and Willamette in 1987, but this gave the men their first outright title since 1981. With a record of 23-0, #2 ranked Whitman is one of three NCAA teams of any division to remain undefeated. Whitman joins Eastern Washington neighbor DI Gonzaga and DII side Northwest Missouri State in this feat. Junior Tim Howell and sophomore Joey Hewitt each put up 17 points Sunday to lead the Blues to victory. The team set itself up for the title by ousting the University of Puget Sound 92-87 the night before. NCAA tournament bids are decided by the NWC tournament, which features the top four conference finishers. Holding the top spot means Whitman will host the fourth place seed on Thursday, Feb. 23. Both the men’s and women’s basketball teams return home this weekend to take on Lewis and Clark and George Fox.